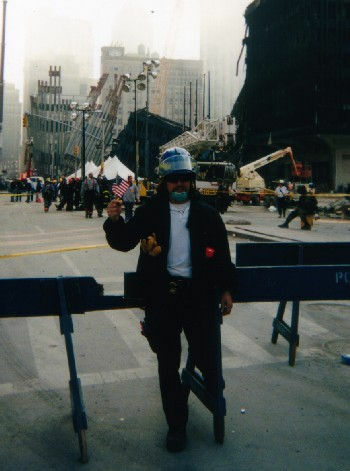 On the morning of September 11th, 2001, one of the greatest tragedies ever to hit America happened in New York City. 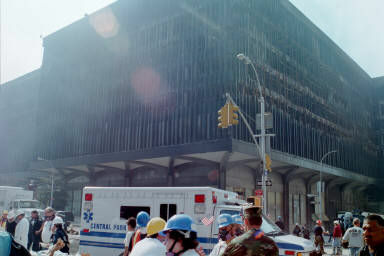 At 8:45 am the first of two airplanes hit the World Trade Center. The Central Park Medical Unit had an ambulance en route at 9:03 am. 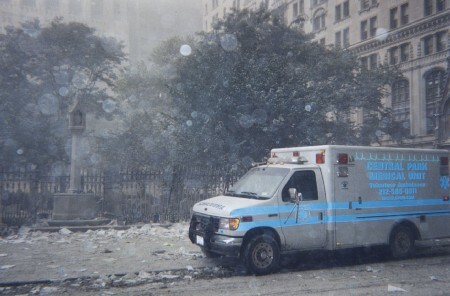 Our dedicated volunteers remained in continuous service for days, on ambulances, bikes, at local hospitals, in triage units near Ground Zero, and throughout the city, helping those in need. Please join us in honoring the memory of our many fallen brothers and sisters in uniform who gave their lives in the heroic effort to save others at the World Trade Center. 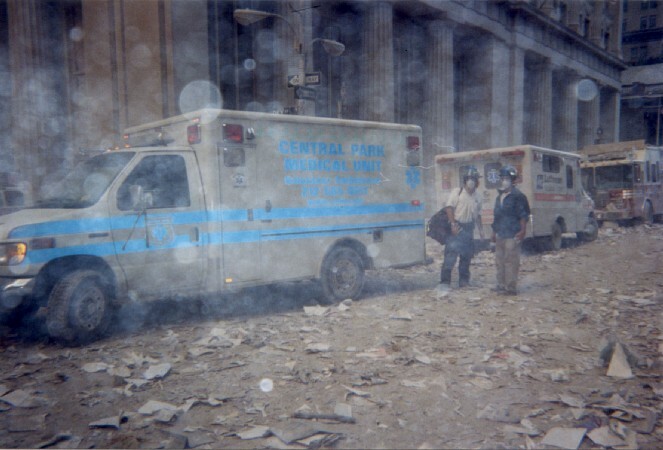 The members of Central Park Medical Unit had the great privilege of working closely with many of these heroes. All of us in the Emergency Services feel the loss of such good men and women. They can never be replaced, but the work they started can be continued by those of us who remain. We mourn for all who lost their lives in this horrendous terrorist attack. New York, NY November 2, 2012 – On Sunday afternoon, fences closed off Central Park in anticipation of Hurricane Sandy. Instead of putting our ambulances out of service, however, Central Park Medical Unit geared up for what would be a multi-day response effort as the impending hurricane would leave a path of destruction in its wake. At the request of the Office of Emergency Management, CPMU responded to the Manhattan Veteran’s Administration Hospital to evacuate patients in advance of the storm. This well orchestrated evacuation process was CPMU’s “calm before the storm,” as our assignments in the days that followed were much more taxing, chaotic, and dangerous for our volunteers. By Monday evening, CPMU’s entire fleet was involved in storm-related response, which would continue virtually uninterrupted through early Thursday morning. In total, 28 volunteers were involved in the response effort, with many more standing ready at the wings should the operation have continued further. On Monday night, CPMU volunteers participated in the emergency evacuation of NYU Langone Medical Center in Lower Manhattan. Over two hundred patients, including premature infants from the hospital’s Neonatal Intensive Care Unit, were rescued after both of the hospital’s generators failed. CPMU had ambulances on site within minutes of the call for help and worked throughout the night, transporting patients to other medical facilities which still had power. “The teamwork between the hospital staff, the Fire Department, Police Department, and all other ambulances was tremendous,” Garry Resnick, the Medical Unit’s VP of Operations said of the NYU evacuation. Patients on life support were painstakingly carried down many flights of stairs to ambulance stretchers that had been lined up on the 1st floor hallway. Hospital staff then accompanied them in the ambulances to other facilities. A photo of a neonatal patient on life support being loaded into a CPMU ambulance has been widely circulated around the world via the media. 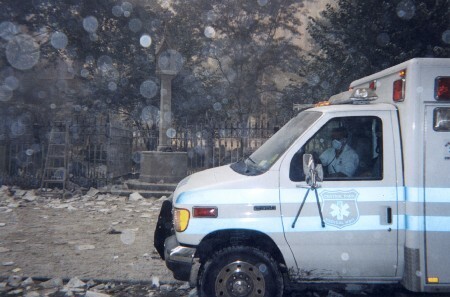 The completion of the Horizon evacuation was timely; as soon as our fleet returned to Manhattan, we were immediately re-deployed to Bellevue Hospital, which had just begun an unprecedented full scale evacuation, after having realized that the building’s infrastructure was so critically damaged that the facility could no longer function, even with generator power. Working alongside 80 other ambulances, the FDNY, NYPD, National Guard, and numerous other agencies, CPMU EMTs again evacuated patients and transported them to other facilities through the city. Our crews worked into the early hours of Thursday morning. While CPMU and many other agencies were successful in saving countless lives over the last several days, there were unfortunately many fatalities caused by Hurricane Sandy. Our thoughts and prayers go out to those families who have lost loved ones and who will be facing difficult times ahead in the aftermath of this devastating act of nature. As our 5-day response to Hurricane Sandy comes to a close, and we can focus on getting back to our normal operations, Central Park Medical Unit would like to recognize its volunteers who tirelessly worked to help our community, even in the midst of a total power and water loss in some of their homes: Brian Goldberg, Channa Wooten, Gabriel Tissian, Garry Resnick, George Contreras, Greg Levow, Joel Rowe, Jonathan Ehrlich, Kate Ague-Kneeland, Kelli Mullin, Marc Musicus, Mark Sanders, Matt Labunka, Matthew Tirschwell, Maggie Dicks, Megan Flynn, Miguel Gomez Marshall, Rafael Castellanos, Rafael Castellanos Jr., Roger Smith, Roger Thomas, Sam Bruce, Staley Dietrich, Steve Peluso, Dan Peneyra, Tareek Propst. 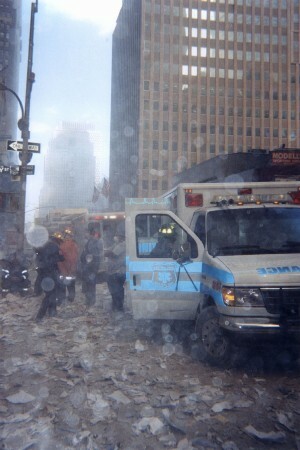 The Northeast blackout of 2003 was a widespread power outage that occurred throughout parts of the Northeast and Midwestern United States and Ontario, Canada. Just before 4:10pm EDT, with an air temperature of 88 degrees, this caused an immediate emergency in New York City, as 14,300,000 city residents lost power. Across all affected areas, the blackout affected an estimated 55 million people. The Central Park Medical Unit responded immediately, and within 15 minutes of the start of the blackout, two BLS ambulances were fully staffed and responding to calls. 12-hour shifts were planned and relief crews were organized and scheduled through the weekend, allowing for continuous service throughout the incident. 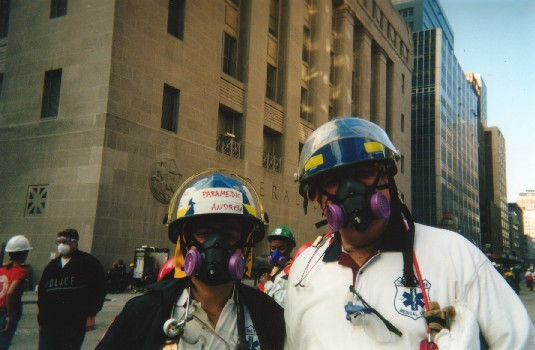 With regular communication means such as land lines and cell phones not functioning, the unit’s members responded promptly to the unit’s pre-arranged emergency response location to begin their tours. Due to the power failure and resultant breakdown in communication infrastructure, CPMU was unable to establish contact with the City’s Mutual Aid Response System. Fortunately, however, we were able to make contact with both NYPD and New York Presbyterian Hospital’s EMS dispatch, which allowed for the necessary communications. 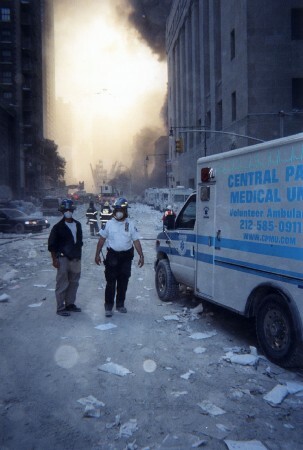 During our work with this incident, CPMU members were provided meals by the Tavern on the Green restaurant in Central Park, New York Presbyterian Hospital, and Roosevelt Hospital. We are very grateful for their support. 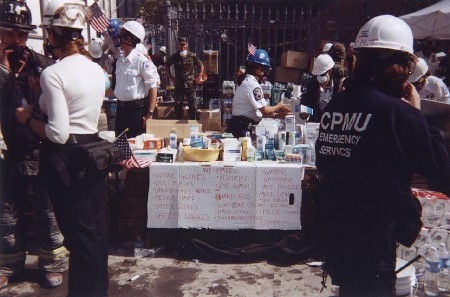 In addition to 9/11, Hurricane Sandy and the 2003 Blackout CPMU has responded to every large-scale NYC disaster in the last 35 years. These responses include the 1993 World Trade Center Bombing, the Blizzard of 2010, Hurricane Irene, TWA flight 800, American Airlines flight 587 and others. CPMU is dependent on private donations to fund our operations. Help prepare for tomorrow's disaster.